First off, I'm quite honored to be a finalist for Saveur Magazine's Best Baking and Desserts Blog! Thank you to whoever it is out there who was a big enough fan of this blog to submit a nomination. I heard the news in the middle of a week that was riddled with rejection letters and hearing a lot of "no"s and "you're not good enough"s, so it feels pretty good to be recognized for some accomplishment, even if it's just me prattling away here and in my kitchen every week or so! Lots of off-line things have been happening for me this week (things so big that the Saveur news only registered as a tiny blip on the radar), but I'm still in the middle of processing them all before I feel like I can talk about them here on the blog. In the meantime, though, I wanted to share one of my latest flavor obsessions: limes. Oddly, this year more so than in any previous year, I've become horribly impatient about wanting warmer weather. It's uncharacteristic of me, because I'm so warm-blooded that I usually prefer the cold. Maybe, though, it's a symptom of too much non-stop stress, and I just need some sun, sand, a warm ocean, and a couple of nice, deep breaths. Barring a currently-impossible trip to the beach, limes have been the next best thing, their sweet, tart crispness reminiscent of frozen drinks and fish tacos. Ah, the fish tacos. 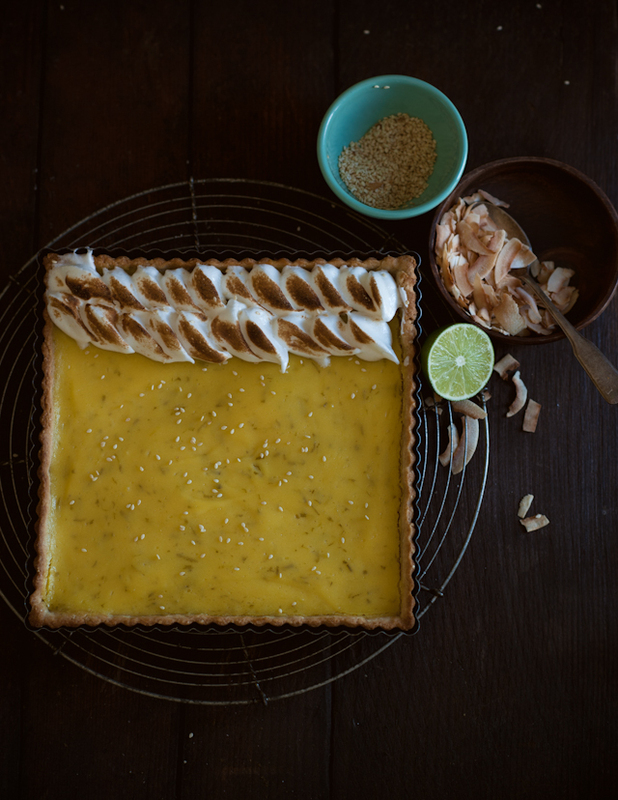 This tart des tropiques is my 'I wish I were in the tropics' spin on my favorite kind of pie: the lemon meringue. 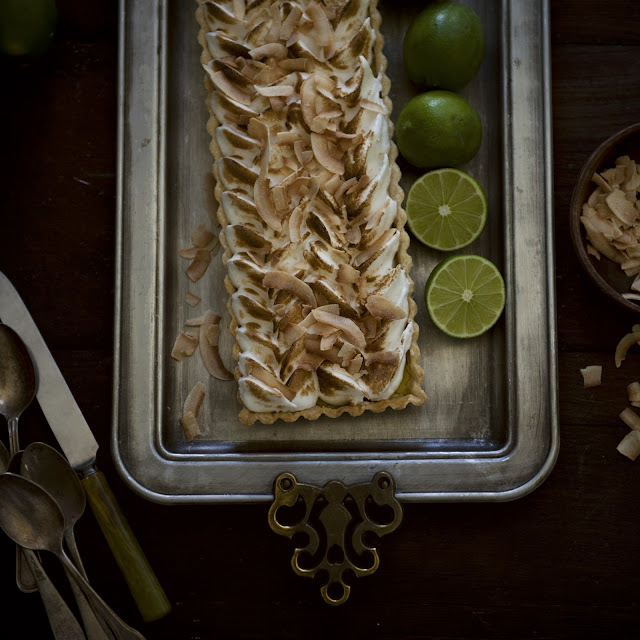 Here instead, nestled in a slightly nutty sesame seed crust, is a sweet and tangy and lusciously creamy lime curd--not quite as bright but more subtly flavored than lemon curd--covered with fluffy and puffy clouds of lightly-caramelized coconut meringue and sprinkled with some toasted sesame seeds and dried coconut chips for some extra crunch. The lime flavor here is definitely the star, with just a whiff of coconut, like the faint scent of the tropics that wafts through the warm night air when you're sitting in a rocking hammock strung between two palm trees on the beach, soft sand at your tiptoes and the ocean gently, softly ebbing away in the close darkness.... sigh. Lastly, in other news, the second issue of sated is almost done! More news on that front to come very shortly. Stay tuned! 1. for pastry. Combine the flour, sesame seeds, sugar, and butter in the bowl of a food processor and pulse until the butter is the size of small peas. Add the egg yolk and sesame oil and pulse to combine. Add the water, one tablespooon at a time, while processing, just until the dough holds together when pressed between two fingers. Do not overmix. Remove the dough from the food processor, form into a small, flat disc, cover tightly with plastic wrap or parchment paper, and refrigerate for at least one hour. The dough should be firm to the touch. 2. Preheat oven to 425° F. On a lightly floured surface, roll out the cold dough to ⅛-inch thickness. Transfer to tart pan, press in the bottom and sides, and prick the bottom a few times with a fork. Return the pastry to the refrigerator if it has softened. Line with a piece of parchment paper, fill with pie weights or beans, and bake for 13 to 15 minutes. Remove the weights and the parchment paper, brush the insides of the pastry with a small amount of egg white, and return to the oven for 3 to 5 minutes more, until the crust is golden brown. Remove from oven and let cool completely on a wire rack. 3. for lime curd. Preheat oven to 375° F. Suspend a bowl over simmering water. Place the butter, lime juice, sugar, and salt in the bowl and let cool, whisking occasionally, until the butter has completely melted. Meanwhile, in a separate bowl, beat the eggs and yolks to combine. 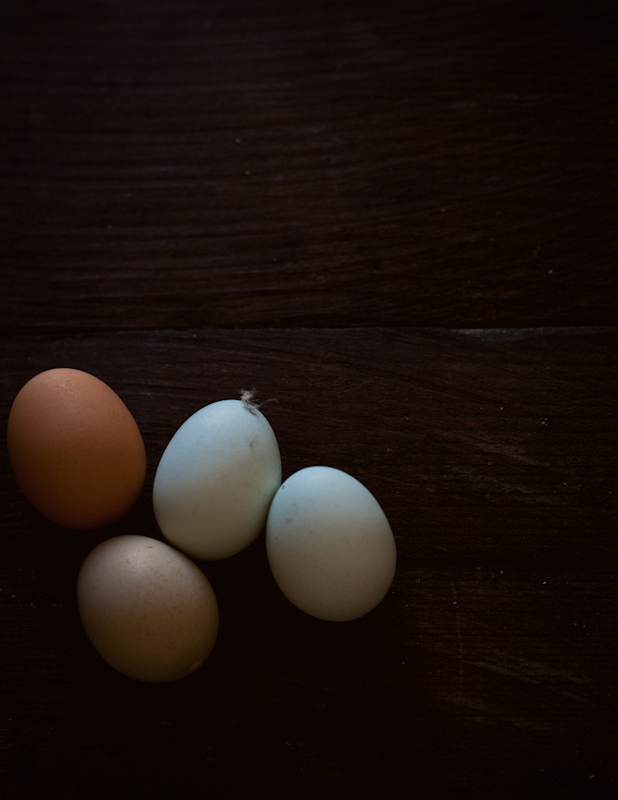 When the butter has melted, temper the eggs by gradually and slowly pouring about half of the butter mixture into the eggs, whisking continuously. Continue to cook over simmering water, stirring and scraping the bottom of the bowl with a spatula, until thick, about 10 to 12 minutes. Remove from heat, stir in the zest, and pour the curd into the prepared tart shell. Bake the tart for 10 minutes. Remove and let cool completely. 4. for meringue. In a bowl suspended over simmering water, beat the egg whites, sugar, salt, and cream of tartar until hot to the touch (140° F on an instant read thermometer). Immediately add the coconut extract and transfer to the bowl of a stand mixer with the whisk attachment. Beat just until stiff, glossy peaks form. Do not overbeat! 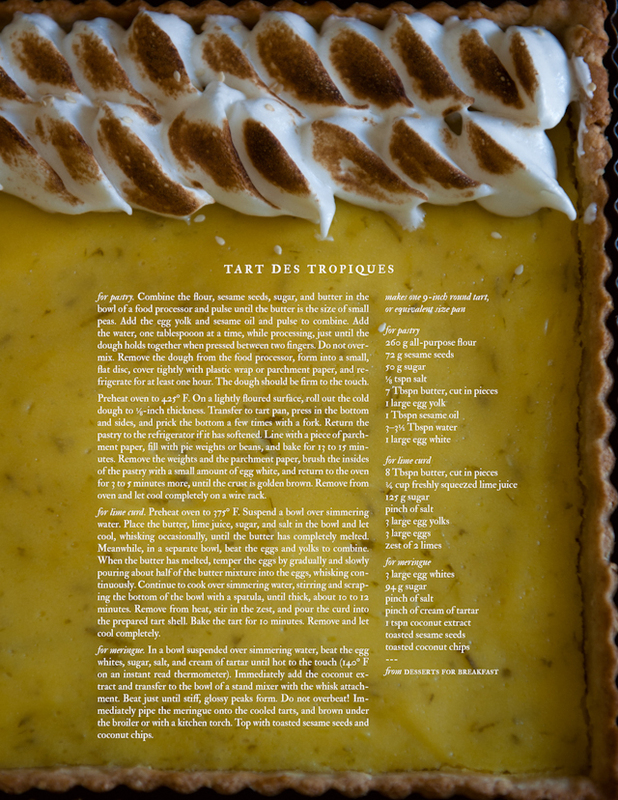 Immediately pipe the meringue onto the cooled tarts, and brown under the broiler or with a kitchen torch. 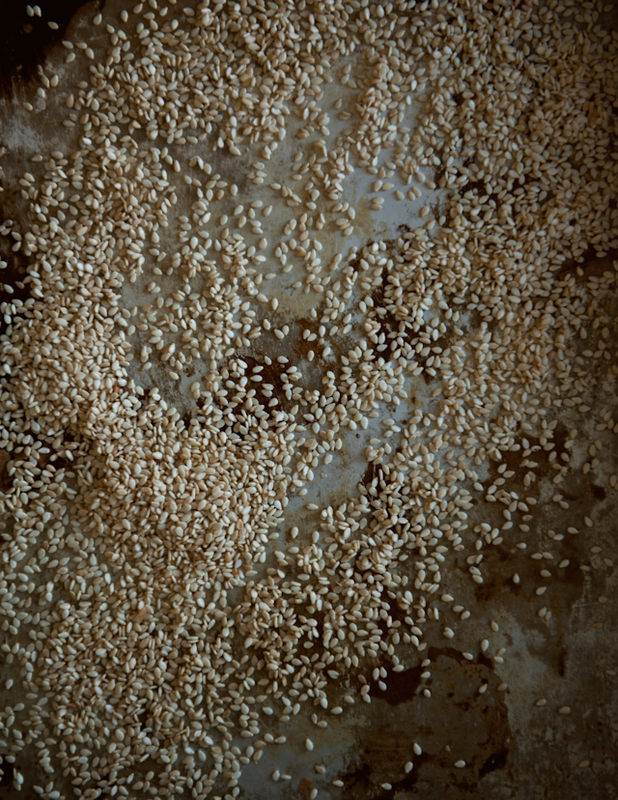 Top with toasted sesame seeds and coconut chips. Ooo my God! It's fantastic! This sounds so delicious and I adore the way you've piped the meringue - it gives it such a professional finish! You deserve your nomination. Your baking and photos knock me off my feet every time! 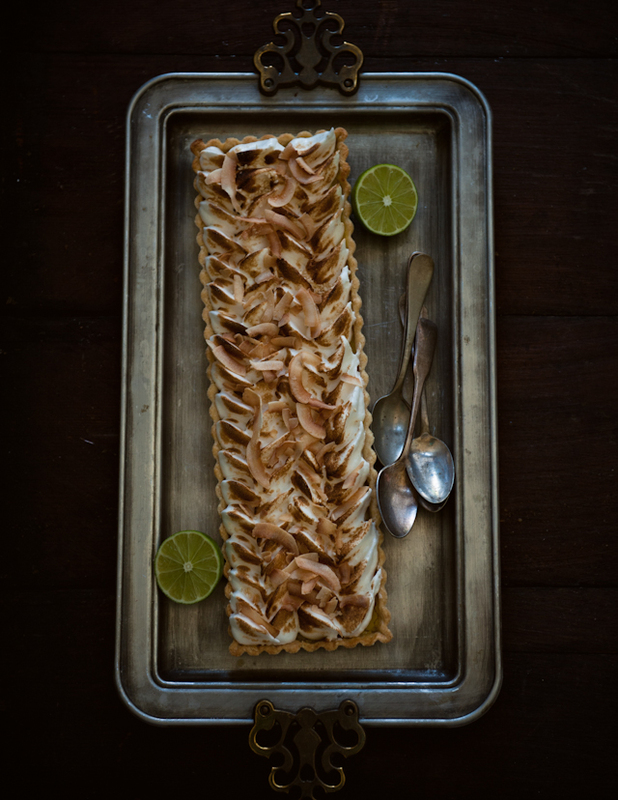 The piping is gorgeous, and it sounds like a lovely tart with all the refreshing flavours combined! I nominated you! Well, I was one of the people who nominated you. I'm certain there were others. :) Your beautiful blog is wonderful, and I always look forward to your stunning, lush photos. Heart-felt congratulations on the nom! Well done. Love it! 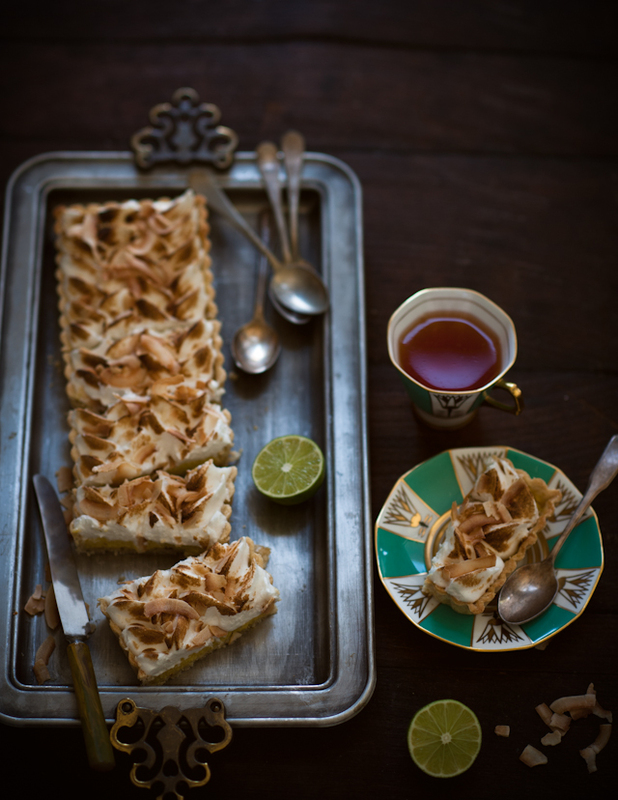 What a wonderful, upscale take on lemon meringue pie! That looks so incredibly good. Wonderful pictures.